With the aid of Turkey, Iran, and the Russian Centre for Reconciliation of Opposing Sides, Syria has recovered territory previously occupied by rebel groups and oversees ceasefire compliance, allowing, finally, for the return of refugees. Isn’t that the traditional notion of what refugees are, that once conditions permit, refugees return to their country of origin? That certainly isn’t the notion of the U.S. government’s Office of Refugee Resettlement, that’s overseen by the Dept. of Health and Human Services. To that Office, and to the “charities” it funds to do the actual resettling, resettlement does not mean resettling refugees in their countries of origin, it means resettling them permanently in Maine, Minnesota — anyplace you may still think of as being white. Perhaps Russia’s government doesn’t support the White Genocide that’s being carried out by flooding EVERY white country and ONLY white countries with third worlders and forcing integration/assimilation with them that will blend whites out of existence or reduce whites to tiny minorities. Perhaps Russia’s government isn’t anti-white. Or if that’s a little too generous (see comments), I think we can at least say that Russia’s government is much less anti-white than most governments of white countries today. I’m imagining the uproar, the “moral” outrage by U.S. anti-whites, if the U.S. government were to return 100,000 refugees to their country of origin during just a few months. If you’d like to broadcast to a larger audience your opposition to the way refugee resettlement is done in the U.S., you can take the pledge to anonymously initial our second message about refugee resettlement. It will be displayed on the website of the White House as soon as it has 150 initials following its submission on Sept. 1. You don’t have to be a resident or citizen of the U.S. to participate. The Russian government does support White genocide. Russian men have lower life expectancy than North Korean men and Asians are set to take over the country. 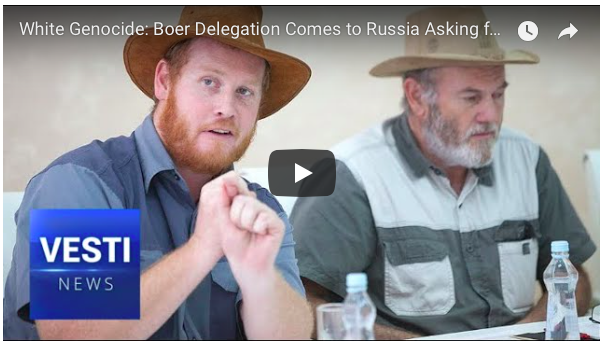 Russia seems to be the only country that has a pro-white attitude toward the besieged Boer farmers in South Africa. In the U.S. and Europe there sure won’t be any resettlement programs for whites who are fleeing torture and murder. Russia was always tardy in adopting Western ways, and now it seems they don’t understand exactly how this White Genocide thing is supposed to go. Rescuing whites and informing the world that whites are the objects of genocidal torture and murder by a post-racist non-white state is not the way to begin pulling your weight in carrying out White Genocide! 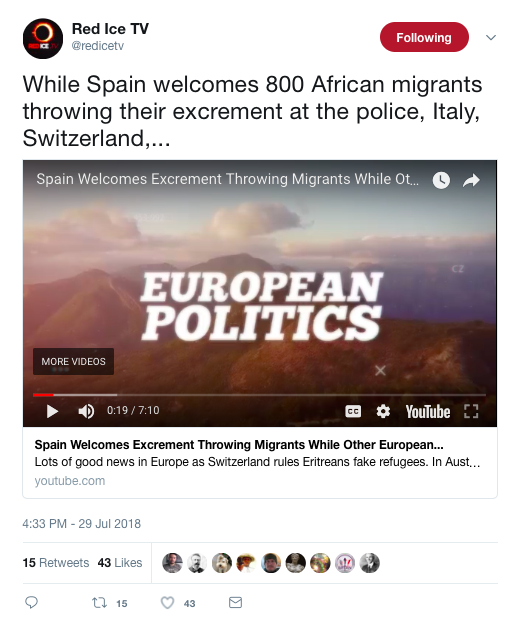 Red Ice 7-minute summary of recent immigration events in Europe 7-29-18.